Win a $75 Gift Certificate to Hard Rock Cafe! Congratulations to Erica Christian on winning our sixty sixth High Five Giveaway and thank you to all who entered! 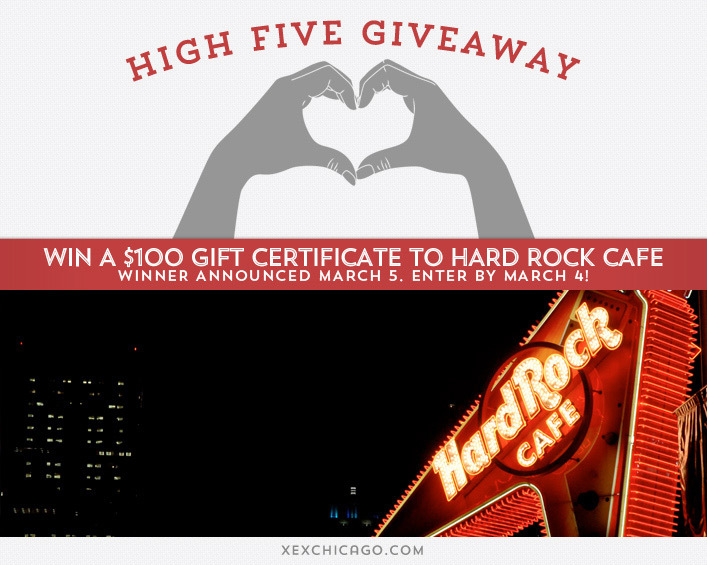 Our next High Five Giveaway is for a $75 gift certificate to Hard Rock Cafe. Does hair color absorb better on clean or dirty hair? Now, just add a comment to this post with the right answer to be eligible to win! The winner will be announced on Tuesday, April 15. Entries must be received by midnight on Monday, April 14. Good luck! All individuals 21 and older are eligible, whether you are a client of XEX or not. Must be able to pick up the gift certificate at XEX, 35 West Wacker Drive, Chicago. Gift certificate must be picked up within 30 days of announcement of winner. Leaving a comment opts you in for the XEX email list, which is sent out 1-2 times per month. You may unsubscribe at any time. Clean hair absorbs color better. Clean Hair. The color is harder to absorb on dirty hair. I always thought it was dirty. But it’s clean hair. Clean hair! Although always thought dirty! Color absorbs better with clean hair. Clean and dry hair! Can’t wait to get my hair colored soon! Dirty! Or really, just not so freshly washed hair. Clean hair! Dirty hair makes it hard for the color to cut through.